DUAL SPONSORSHIP SAVES YOU 50% OFF SECOND EVENT! 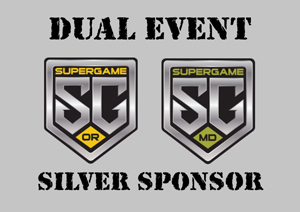 SuperGame DUAL Silver Sponsorship/Booth for both the Oregon and Maryland events. $750 cash or $1500 in prizes. You get your name listed as a SILVER SPONSOR, your logo (small) placed on the site, but no links and no banners. If you attend the event, you get up to a 10x20' space under a tent with 2 tables and 2 chairs for your booth. You are allowed to sell anything except paintballs and food or drinks.